Create completely custom crosshairs of any color, size, animation, etc.! The possibilities are endless. This mod was designed to allow users to create any crosshair they like without the limitations built into Vanilla Minecraft. Change the size, color, and more with just a few clicks! The mod comes with 8 different crosshairs built in, but you are able to make your own with PNG files and JSON (more on this later!). This mod only introduces one command: /crosshair. This will pop up a GUI where you can swap between which cursor you're using with the arrow buttons or customize a crosshair by clicking on "Configure." Pressing "Save" will apply the crosshair that is currently selected. Configuration of individual crosshairs fortunately isn't hard either. If there is some slight modification you'd like to make, it's easy! From the /crosshair menu, click on the "Configure" button with the crosshair you'd like to change selected. In this menu you're able to edit the scale, framerate, and frame count of your crosshair. Scale - How large your crosshair is. 1.0 is Minecraft's default size. This might be enough for you, but there's one final configuration menu you can use: the colors menu! Adjust the color of the crosshair by sliding the red, green, and blue sliders until you find the color that you'd like. The "Negative Color" option lets you toggle vanilla Minecraft's feature that makes the crosshair's colors invert when hovering over bright colors. If you have a .png file and a .properties file for a crosshair that you'd like to install, you can do so. All crosshair files are stored in .minecraft/crosshair/assets/animatedcrosshair/ (.minecraft being wherever your Minecraft folder is). All you have to do is simply move the two files into this folder and you're good to go! You shouldn't have to restart the game if you have one running already. While making your own crosshair is more advanced, it isn't too hard! Understand the animation system. All animations are stored in a .png image file, each frame being 1/16th by 1/16th of the image's size. 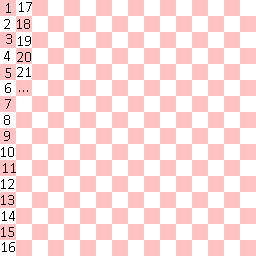 If you want your crosshair to be 32x32 pixels, then you'd need to create a new image canvas that is 512x512 (512 / 32 = 16). White backgrounds are rendered, so make sure to make the background transparent by deleting all that white space that you don't want visible! The mod will loop through each box at the framerate set in the config until the box that it's currently on is beyond the number of total frames in the animation (also set in the config), at which point it loops back to the beginning. Create a new canvas in the side that you'd like and add in each crosshair frame for the animation. If you only want one frame (i.e. no animation), then you only need to fill in the top-left corner. Continue putting each frame into its appropriate section of pixels until you're done. This file contains all the settings corresponding to your crosshair. It might be easiest to edit this file from in-game, to make sure you don't make any mistakes, so we can just close it now. Start the game, do /crosshair, and navigate until you find your crosshair. Hopefully it will show up! If it doesn't, then you've done something wrong. Feel free to ask for help! You should be able to now click on "Configure" to change all the settings for your crosshair. Once you're done, click "Save" and voila! You've just made yourself a crosshair! Will this affect my PVP skills? It likely depends on your crosshair. I have tried a multiple of crosshairs and to my surprise it had no noticeable effect on how good I was at PVP. I want a different crosshair, but I don't know how to make one. If you have a GIF or a general idea of a crosshair you'd like but aren't able to make it yourself, feel free to DM me on Twitter (@bugfroggy) and I can do my best to make it for you if I have the time. Please try to make it yourself first (I of course reserve the right to refuse any requests). I just made a crosshair. How do I include it on the downloads page? Contact bugfroggy using your preferred method with the .properties file and the .png file so I can review it and add the download if necessary. I thought about it so possibly. :) Will think about it.